Known for their past big hits like “Santa Monica” and “Father of Mine,” Everclear, the alternative outfit from Portland, Oregon, have definitely seen their share of fame since their formation in 1992. It’s been three years since their last album, “In A Different Light,” but their newest release, “Invisible Stars” proves that they have still got it now as much as they did back then. Everclear are current Co-Headliners on this year’s Summerland Tour, along with Sugar Ray, Lit, Gin Blossoms and Marcy Playground. 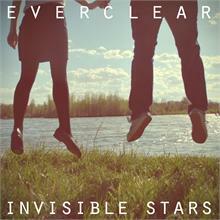 “Invisible Stars” manages to capture everything that makes Everclear well, Everclear. They pick up right where they left off with their last album, yet still spin a bit of a different sound. It’s very mellow, but it still works. Everclear’s current lineup includes Art Alexakis (Lead Vocals/Lead and Rhythm Guitar), Dave French (Lead/Rhythm Guitar/Backup Vocals), Josh Crawley (Keyboards/Backup Vocals), Freddy Herrera (Bass Guitar/Backup Vocals) and Sean Winchester (Drums/Percussion). The key word is “current,” as this is the band’s fourth different full lineup. 50 year-old lead singer Alexakis remains the only original member in the group. You wouldn’t be able to tell that there have been so many lineup changes, as Alexakis pretty much leads the show and keeps the very essence of the band intact. Despite his age, his voice is still as prominent as it was back then. The album’s lead single, “Be Careful What You Ask For” is the perfect representation of this album and where the band finds itself today. It’s a keyboard-happy, feel-good rocker, with the catchiness and bold lyricism that showcases Everclear at its best, where no other band can touch them in that category. There is a great flow to this album as tracks transition pretty flawlessly. Every track at least offers something different. A couple of high points in the album, like tracks “Falling in a Good Way” and “Aces,” serve a fast-paced tempo peppered with crunchy riffs reminiscent of today’s pop-punk. It’s easy to defer that many bands drew their influences from Everclear with this song. “Jackie Robinson” features a unique piano intro that fittingly sounds like it came straight out of the 1940’s. The lyrics tell a great story as well, it stands out the most on the album. What makes this album are in fact, the lyrics to most of the songs, as they bleed out much emotion and tell great stories. That is also what has made Everclear so different from the rest of the alternative pack. With “Invisible Stars,” it’s clear that Everclear is back in full-force now and are not to be messed with. Hell’s Kitchen Coverage: Clemenenza’s Day Out or 50 Shades of Gray?